Blok Copy began as a game written in order to learn the Atari 2600 hardware, where it utilised vertical splits to achieve seven independently coloured playfield objects. Although the Atari 2600 version is near enough complete, to date it remains unreleased on T.M.R's workstation. 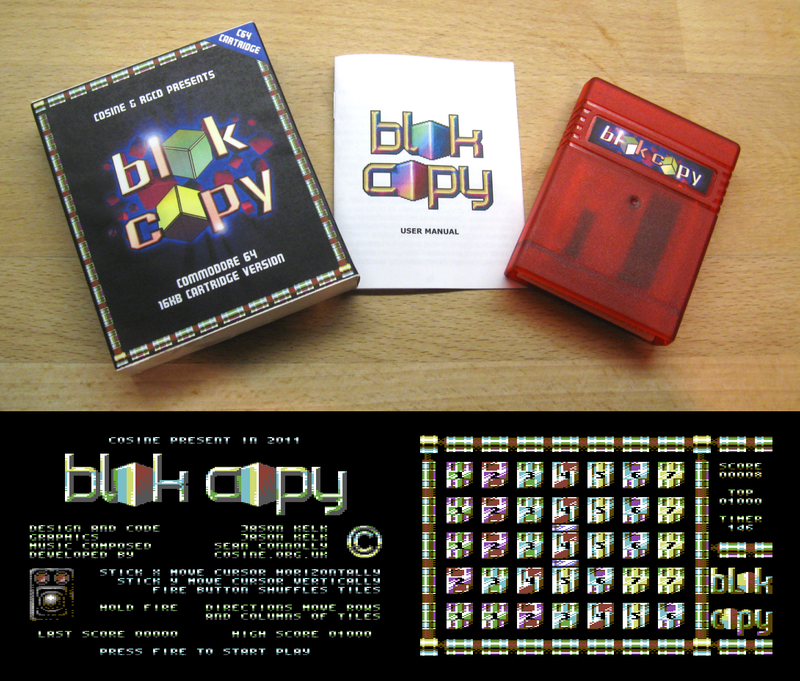 However, although the game is yet to make it's debut appearance on Atari hardware, Blok Copy has been released on three Commodore variations; namely the PET, C64DTV and of course the C64 (this cartridge). Shortly after releasing the C64DTV port of the game in 2009, T.M.R mailed over a feature complete C64 version of Blok Copy using the PET version's character graphics as temporary placeholders. Then in mid 2011, a video of a beta version of the game with proper multicolour graphics popped up on YouTube, with a comment suggesting that it may be suitable for a 16KB cartridge release. After a few small changes, this game is the end result; Cosine's entry in the 2011 RGCD 16KB cartridge development competition. Blok Copy plays similarly to a two-dimensional Rubik's cube (if you can imagine such a thing); instead of moving the blocks independently, you select a row/column via the joystick controlled cursor and rotate it either up, down, left or right. The player's objective is simple; the playfield contains seven numbered and distinctly different patterned tiles arranged into columns of five. At the start of each level the tiles are shuffled around, with the number of moves increasing as you progress through the game. The player must then reorganise the tiles to resemble their starting order against the clock to progress to the next stage until all ten levels have been successfully resynchronised. The game has been tested on both PAL and NTSC machines, and works on the C64, C128 and C64GS (there is no keyboard input required to play). It comes in a slimline cardboard box with manual, and the cartridge is a transparent split candy-coloured shell (one colour on the top half, another colour underneath) containing an internal bright LED so that it emits a glow when plugged in. An official Cosine disk version will be available for free download in the near future. (I'll try to convince TMR to release the original ROM font version too as additional bonus content on the D64). The game can be purchased on cartridge from our shop, and retails at £17 plus shipping.